The irrepressible Carl Malamud recommended to his twitter followers the new Biography of John Moss – People’s Warrior: John Moss and the Fight for Freedom of Information and Consumer Rights. 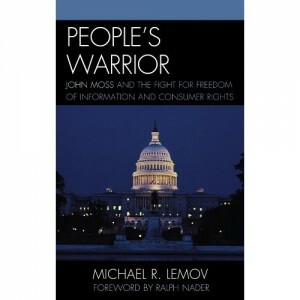 John Moss was the member of Congress who guided the Freedom of Information Act into law in the US (it took a decade). That, and stories of the other causes he took on, makes a really interesting book. Just Do It is a story of passion, politics and power, and the interactions between the three.